Integrating a Content management System into the back-end offers the site owners to effectively manage, update or modify content on the apps, in real time. 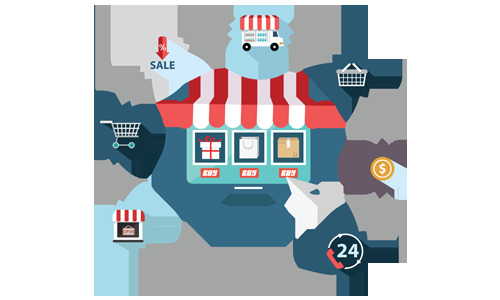 E-commerce applications often have a prerequisite for high scalability owing to the extremely dynamic nature of users, user accounts, products catalog and the amount of transactions. Security is integrated into the application right at the onset of the development stage through software security consulting, PCI DSS certification and code validation. The development team at Optimum Logic has worked on some of the most amazing and challenging e-commerce applications and web solutions that have empowered the clients in growing their businesses from strength-to-strength. With a single-minded focus on enhancing as well as leveraging every aspect of the offered development solution, the development teams ensure that the clients' digital marketplaces are up and running at all times. An Agile and iterative app development approach facilitates the release of fully functional build modules at the completion of every sprint cycle. Moreover, a single repository for project codes allow for project builds and automated tests that enables efficient collaborations from even remote teams.